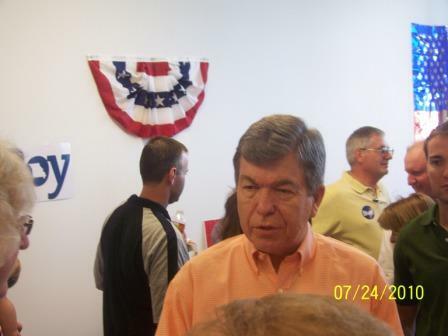 Roy Blunt visited the Republican campaign headquarters this morning here in Clay County. Attending as well was the other US Senate candidate, he who shall not be named by the Republican establishment unless we really have to, Chuck Purgason. My wife and I attended as Chuck Purgason supporters. I am not going to rehash the reasons I am supporting Chuck. You can read that on my endorsement post here on this blog. I wanted to comment on some specific things. First, this was the first time I have ever heard Mr. Blunt speak in person. If he wins the primary here in Missouri in the Republican party I can and will vote for him. I do have my reservations, but right now, as it stands, I feel there is a candidate out there that would better represent me in the Republican party. The reality is this, if Blunt wins, the choice is between a conservative who has made a few, but critical mistakes, or another vote for Obama with Robin Carnahan. Not my words, that’s what the President said. Mr. President I have had enough of your leftist agenda and you need to be put under control. America and Missouri can’t put up with another Democrat shape shifting Senator like Cousin Claire. Second, kudos to all Republicans in attendance. There were many faces from politics in the area. As a whole people were very respectful, Mr. Blunt and Mr. Purgason were civil and polite towards one another. Mr. Blunt went as far to say in his short speech that he would support all Republicans in this election. I interpret this as, if he is beat he will get behind Mr. Purgason. I would fully expect, and get the impression that, if Mr. Blunt wins the primary Mr. Purgason will get fully behind Mr. Blunt. I also want to recognize Clay County Central Chair Ben Wierzbicki, he handled the event well and as a supporter of Mr. Purgason’s I felt welcomed into the campaign HQ. Third, I had the ability to talk with Mr. Blunt one on one about an issue that is important to me. That issue is education. As a teacher I am fully fed up with the involvement of the Federal government inside of our classrooms. No Child Left Behind was something that Mr. Blunt voted for and I have a major problem with that. I first asked him why there was nothing on his website about education. I must admit I made a mistake here, it had been some time since I had last checked his website and somewhere along the way it has been added. You can read it here, Blunt on Education. It’s the small things that people do some times, and one thing Mr. Blunt did really irritated me. Early in our conversation he attempted to kind of put the whole issue of education to rest by saying that there is a group out there called teachers for Blunt. No offense, but I don’t care. Last time I checked I was an individual and had my own opinions, I do not look to others of my own profession to determine how to think politically. As a matter of fact I don’t do this with anything, I arrive at my own opinions based upon thought and further research. Anyway, I further pushed on Mr. Blunt about NCLB and he did admit that his vote for NCLB was something he regretted and wishes he could go back and change. Ah, if only politics worked that way. He did also say that he was for more local control in education, and that some of his votes reflected this after the passage of NCLB. I have seen one vote for sure that supports this, I would suspect that he is being honest about this. The fact remains the Arne Duncan and Barack Obama education agenda is toxic to public schools in America and we need politicians that are willing to express their concern about Federal involvement in schools. Mr. Blunt seems to agree, I just wish he was more passionate about it. I do appreciate his time and willingness to answer my questions about this issue. Finally, kudos to KSHB 41 for showing up with a cameraman. It was the only TV media presence in attendance. I don’t have high hopes for the report, but it was nice to see one camera there. I was sent a poll today by a Facebook friend. I was amazed at what I found. The data in this poll indicates that not only is state Senator Chuck Purgason the right candidate for Missouri, but could potentially defeat Carnahan in the general election IF he gets more name recognition. Now I have to admit right off that the results in this poll technically indicate that the current numbers for a hypothetical Carnahan vs. Purgason race show Mr. Purgason losing. But here is the thing, the poll only shows Purgason losing by 4 points, 42%-38%. The undecideds in this specific question are 19%, this is not an accurate number. Now let’s look at the poll a little more in depth to see how I come to the conclusion that Mr. Purgason could win. First off, the party distribution in the poll is very even: Democrats responding were 36%, Republicans were 35%, and Independents/Others were at 29%. Political ideology identification shows 44% of respondents as Conservative, 41% of respondents as moderates, and only 15% of respondents as liberal. This means that 9% of respondents identifying as independents could lean to the Republican candidate in the general. Rationally, one has to conclude that undecideds are somewhat stratified and that there are going to be conservative minded individuals in that group that would see nothing wrong with voting for Mr. Purgason once they are faced with the monster that is Robin Carnahan. 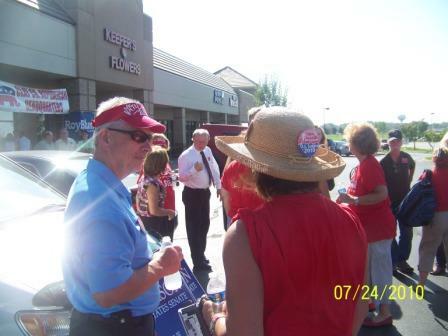 Some of the independents that are sick and tired of business as usual could easily vote for Mr. Purgason. Polling around the nation has indicated that the Democrats are losing independents and moderates in large numbers. Carnahan is polling at 42% against Blunt and 41% against Purgason. She only polls 1% more if Blunt runs. What’s amazing to me is that there is still 13% of people undecided in the Blunt/Carnahan match-up. Let’s dig in even further and look a where the poll really gets interesting. First, it’s good to evaluate the unfavorable ratings of Carnahan and Blunt. This doesn’t come as a surprise to me, but Blunt’s unfavorable rating is at 43% and Carnahan’s is at 41%. Carnahan’s favorable is 38% and Blunt’s is only 25%. Think about this for just a second. Roy Blunt is supposed to be the guy that all Republicans are supposed to unite around. He’s supposed to be THE guy to beat Carnahan and only 1 out of 4 respondents view him favorably. And more people view Robin Carnahan favorably! 57% of voters have an unfavorable rating of Republicans in Congress. That’s 5 more points than those that disapprove of Barack Obama. Just a reminder, but Mr. Blunt is one of those Republicans. 56% of voters have an unfavorable rating of Democrats in Congress. Once again, Chuck Purgason is not a WADC insider that could easily sway voters. Look I don’t think Congressman Blunt is a bad guy, but he stinks with the filth of WADC. Political donations from bailed out banks and Fannie Mae and Freddie Mac. He voted for No Child Left Behind, but feels that problems should be solved at the local level? He voted for the Bush Bailout (TARP), but believes in small government? He voted for Cash for Clunkers, and believes that government should just get out of the way? Somebody please tell me what I am missing here? Mr. Blunt said in his speech at Clay County Lincoln Days that he learned at an early age to not put his hand on a hot stove. Mr. Blunt, the stove was hot for sometime, and you kept putting it on the burner. The Federal Government can not and will not solve our problems out here. I think the results of this new poll are important and something all Republicans should take a look at. Mr. Blunt can be defeated in the primary, and Mr. Purgason CAN defeat Robin Carnahan in the general. It’s really all about name recognition in the end, because Missourians are ready for someone new, someone fresh, and someone who is not a WADC insider who’s hands are stained with the money of lobbyists. Here is Senator Purgason’s campaign website, when you decide that Roy Blunt is not for you, come by and make a donation. This came out of the Chuck Purgason for US Senate campaign. Rand Paul just won the Republican primary in Kentucky. Americans are fed up with the leftists in the Democrat party and the big spending Republicans in the Republican party. People saying that Chuck Purgason can’t win in Missouri aren’t thinking this through, he can beat Roy Blunt, and he can beat an entrenched Democrat by the name of Robin Carnahan. And he would be good for Missouri and this country. “We need to send someone to Washington D.C. who has the courage to stop the federal government spending spree that is escalating the federal debt and threatening our nation’s economic stability. We need to send someone to Washington D.C. who is not entrenched in the corruption and abuse of an expanding federal state. Most importantly, we need to send someone to Washington D.C. who understands and can represent the interests of our great state,” said Jim Schmidt in his press release. “I would like to thank Jim for his great endorsement and the confidence that he has in me. Jim and I share the same concerns about the direction our country in heading. Unless we return our nation to the conservative value of balanced budgets, and end government’s runaway spending, our children and grandchildren will pay the price,” said Sen. Purgason. Schmidt’s endorsement adds to the momentum for Purgason’s campaign. Last week, Purgason won an online poll from the Missouri Sovereignty Project. The poll asked people to choose between Chuck Purgason and Roy Blunt. Purgason won the poll 75% to 25%.